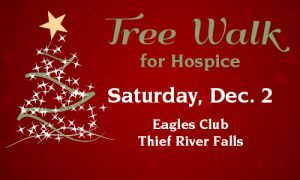 The third annual Tree Walk for Hospice will be held Saturday, Dec. 2 at Eagles Club #2368, located at 305 Red Lake Boulevard in Thief River Falls. Join us for an event featuring beautifully decorated trees, food and a variety of activities throughout the day! See the schedule of events below. All events are free-will donation, except for the auction and bake sale. Net proceeds benefit Hospice of the Red River Valley. 10 a.m. – 3 p.m. Tree Walk – View decorated trees and vote on your favorite. Trees will be available for purchase through a silent auction. Paper angels can be purchased at the event to decorate the Hospice Memorial Tree. 10 a.m. – 3 p.m. Holiday Bake Sale – Take home some tasty treats. The bake sale runs until the items are gone, so get there early! 10:30 a.m. – 1:30 p.m. Santa & Mrs. Claus – Bring the kids for a visit! Photos may be taken, and each child will receive a bag of treats provided by the Eagles Aries #2368.